Deputy District Chief of Muang Chiang Mai District accepted the petition and personally processed Mr. Mong’s document. Chiang Mai, 4th September 2018 – The stateless paper plane competition champion has applied for Thai nationality. The process is expected to take three weeks. 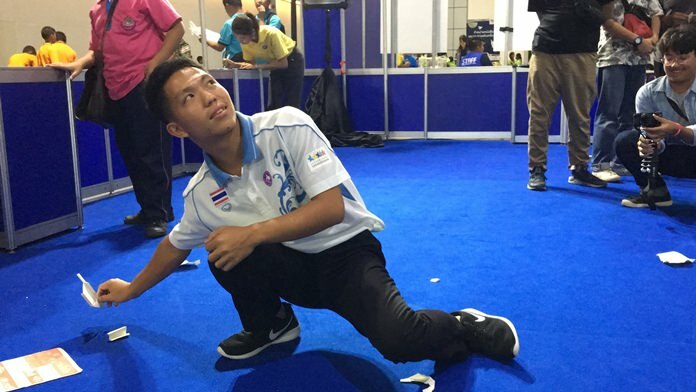 The 21-year old stateless man, Mong Thongdee, who rose to fame as the local and international paper plane champion, this week applied for Thai nationality at the government complex in Chiang Mai Province. The Deputy District Chief of Muang Chiang Mai District accepted the petition and personally processed Mr. Mong’s document. Mong Thongdee demonstrates his extraordinary talents in making paper planes. According to government procedures when accepting requests for Thai nationality, the responsible unit will perform a criminal record check on the applicant, interview two witnesses, and review other relevant documents, before going through the legal proceedings. Consideration takes roughly 90 days to complete, with another 30 extra days for additional scrutiny, if needed. However, in the case of Mr. Mong, it is speculated that the Chiang Mai Governor may shorten the procedure to a week. After the examination process is done, the governor will ask the Department of Provincial Administration to assign a 13-digit ID for Mr. Mong. The paper plane champion can then file a petition with the Office of the Registrar Suthep Sub-District Municipal Office, before heading back to Chiang Mai’s capital district office for the issuance of a citizen ID card. Mr. Mong hopes to receive his first ID Card within five months, while saying he hopes to purchase a piece of land, so he can build a house on Thai soil. He is planning to study for a bachelor’s degree in civil engineering, in order to stay in the construction field like his father before him.